Nearest: Tube Station: King"s Cross Thameslink 246 yards (224 metres), Railway Station: London Kings Cross 246 yards (224 metres), DLR Station: Tower Gateway 2.4 miles (3.9 km), Motorway: M1 Junction 1 5.5 miles (8.8 km). The 5 tube stations and 4 railway stations in a half mile radius (0.8 km) of the hotel means transport links are excellent. The Montana Excel is located on the northern edge of central London. This is between Kings Cross, Angel Islington and Russell Square. Despite the hotels name the hotel is NOT anywhere near the Excel exhibition centre but is within the heart of Kings Cross. This might be considered one of the more dowdy parts of central London but you are still within a mile walk from the major tourist areas such as Oxford Street and just a little further (1.5 miles) to the swanky fashion shopping in Bond Street. The restaurants and adult clubs of Soho are within 1 mile. Of course by far the biggest plus for the Montana's location is being just 150 yards from the Eurostar terminus of St Pancras with services direct to Paris in France. There are actually 12 tube stops within a mile of the hotel. Then of course the hotel sits just off of the A501 Euston Road. This gives great road links out of west London (and Heathrow airport) as well as into the City of London (financial district) which is just 1 mile and a half to the east. Some places of interest within a short walk include the British Museum which is just 200 yards away. Benefiting from being located within a quiet square in an otherwise hugely bustling part of London the Montana Excel hotel offers value for money accommodation. Definitely a no frills hotel whose location is its biggest asset. Ideal for all the major areas of central London. The hotel is housed within a former Georgian townhouse. Despite the name this is nowhere near the Excel Exhibition centrre so do not be confused by the name. Only 2 minutes walk from Kings Cross and St Pancras stations. Some rooms have a shared bathroom but most are en-suite. The shared rooms are clearly marked a such when you check rates. All rooms come with a television, free wireless internet access and tea and coffee making facilities. The Montana Excel hotel serves a buffet breakfast and includes full English and cereal options. The hotel has a front desk which is always staffed, 24 hours and can provide irons and ironing board. The hotel can also offer luggage storage facilities. Ground floor bedrooms available. Milesfaster ranking: 831st from 866 London hotels, and 309th of 329 three star rated hotels. Another to Consider: Another hotel that is much like the Montana Excel and not too far away (0.1 miles, 0.1 km) would be the 3 star Comfort Inn St Pancras - Kings Cross , where prices begin from around £80 and which has a 65% guest satisfaction rating. If you are looking for something a bit cheaper then take a look at the Z Hotel Shoreditch. 1.4 miles from here (2.3 km), has been rated at 84% by past guests and has rates from around £50. Fancy something highly rated by its guests? We think the 4 Star The Rosebery Apartments could be a good choice, it's only 0.6 miles (1.0 km) from here. The Rosebery Apartments is one of the top rated London hotels with a 91% guest satisfaction rating. 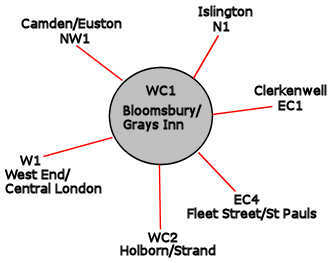 The 50 nearest hotels around this area (16-18 Argyle Square, WC1 postcode) which we have have on our website extend out to a 0.7 miles (1.1 km) radius. The breakdown by star rating is 3 five star hotels (average rating 89%), 17 four star hotels (average rating 82%), 20 three star hotels (average rating 76%), 8 two star hotels (average rating 71%) and 2 one star hotels (average rating 62%). Top 3 star hotels are Premier Inn St Pancras, Premier Inn Holborn and Arosfa Hotel Bloomsbury (all three rated 90%). Of the 50 local hotels top rated is Montague On The Gardens Hotel (4 star) at 99%. Base Rates: We use base rates as a guide to the hotels starting rates. They do not include special offers and deals though so are just a rough guide. Taking all the hotels in the area together the average starting rate is £96 per night. Rates range from £16 at Generator Hotel (2 Star, 77%) with top rates of £222 at Renaissance St Pancras (5 Star, 89%). Rates broken down by star rating: Five Star average: £193, Four Star average: £119, Three Star average: £83, Two Star average: £56 and One Star average: £53.